Green Future Solutions started its first green campaign called mywaterbottle on 22 April 2010, Earth Day. mywaterbottle is a non-profit campaign to encourage more Singaporeans to use their own refillable water bottles, instead of buying or taking single-use bottled water. 1. Create awareness on the environmental impacts of single-use bottled water and encourage people to use refillable water bottles. 2. Show that tap water is safe to drink and tastes just as good as bottled water. 3. Make it easy to choose and buy affordable refillable water bottles that are safe for both environment and health. 4. Build a map of mywaterbottle refillers (water coolers, cafes, restaurants, food and beverage outlets, etc) for easy and free refilling of water bottles. 5. Showcase events that encourage participants to bring their own refillable water bottles. mywaterbottle organises The Tap Water Challenge, which takes the form of a blind taste test for the public. The aim is to show that tap water is safe to drink and tastes just as good as bottled water. The public is asked to taste two types of water – one is from a brand of bottled water and the other is tap water. They will select which one they prefer or feel that there is no difference between the two. The result is revealed after the taste test. Ask them to show their support by signing the mywaterbottle pledge. mywaterbottle provides an easy platform for Singaporeans to choose and buy refillable water bottles that are durable, affordable and BPA-free. 100% of the profits will go to fund water projects in developing countries that provide clean and safe drinking water. mywaterbottle identifies water coolers and invites cafes, restaurants, and food and beverage outlets to join as mywaterbottle refillers and provide free water to anyone with a refillable water bottle. The locations are published on a map of mywaterbottle refillers in Singapore. mywaterbottle showcases events that encourage participants to bring their own refillable water bottles, and reduce the use of bottled water. 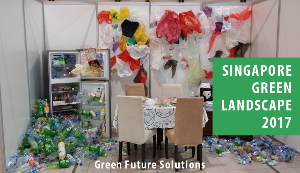 Green Future Solutions is a Singapore-based business that promotes environmental awareness and action for a green future, through its network of green websites, events, presentations, publications and consultancy. For more information, visit http://www.greenfuture.sg.